Low Carb and Gluten Free Fried Cabbage with Kielbasa. Deliciously satisfying -Quick and Easy weeknight dinner on a budget! What could be more perfect? 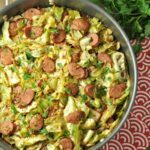 This Fried Cabbage with Kielbasa is one of the most popular keto recipes here on the site, and I can see why. You’ve got to love any recipe that contains inexpensive ingredients, is quick to make, and tastes like you spent hours on it. That is pretty much the food trifecta. 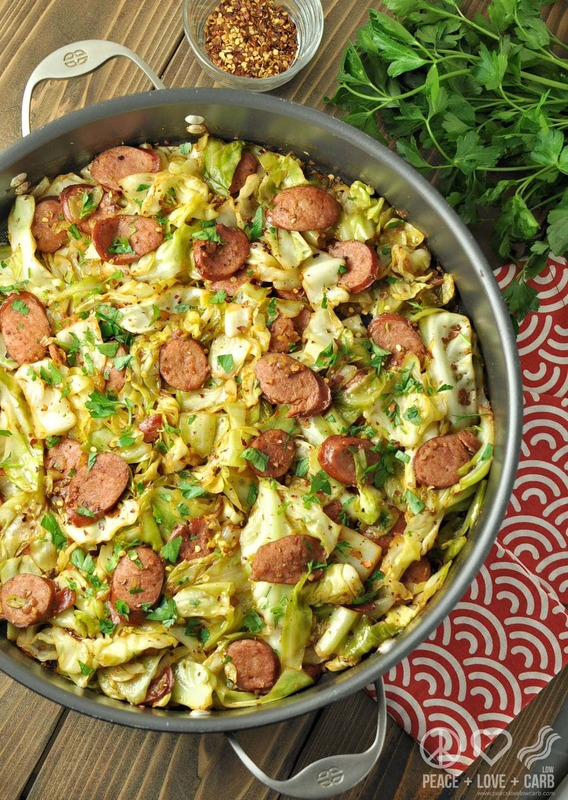 This easy sausage and cabbage dinner fits the criteria for all three. Add in the fact that it is low carb and gluten free, and it’s like winning the food lottery. Cabbage has long since been a low carb staple. 1. Cabbage is one of the oldest vegetables, dating back to the 1600’s. 2. Cabbage is rich source of vitamins C, K, B6 and B9 and minerals such as manganese and calcium. 3. Cabbage contains quantities of fiber and iron, which help to keep the digestive tract and colon in a healthy condition. 4. Cabbage is available in many varieties: red or purple, green and Napa cabbage, usually found in Chinese cooking, bok choi and Brussel Sprouts. 5. Cabbage is: Low in Saturated Fat, Cholesterol, High in Dietary Fiber, Vitamin C, Vitamin K, Folate, Potassium, Manganese, Vitamin A, Thiamin, Vitamin B6, Calcium, Iron and Magnesium. 6. One cup of shredded raw cabbage contains 190% of the recommended daily amount of vitamin C.
7. A thick-witted person may be called a cabbagehead. In Hebrew, the term “rosh kruv” (cabbagehead) implies stupidity. 8. Drinking juiced cabbage is known to assist in curing stomach and intestinal ulcers. 9. If one is looking for ingredients of a low calorie diet, cabbage is at the top of the list. One cup of cabbage only holds about 15 calories. It is definitely a weight-loss food. 10. Cultures in which cabbage is a staple food, such as in Poland and some parts of China, show a low incidence of breast cancer. Research suggests this is due to the protective effect of sulfur-containing compounds in cabbage. Saute until cabbage is wilted and slightly browned. Made the Fried cabbage with Kielbasa last night before I seen your recipe today. About the same except no red wine vinegar, parsley or red pepper flakes. Also used 1/2 teaspoon of onion flakes and garlic powder. Came out very good, my wife even ate it and she don’t like cabbage. Will try your version next time. I to make my version with onions and potatoes with just salt and pepper……made this tonight and wow…i love it..my adult son was over and he really liked it as well. Thanks so much for this…..already “pinned” it. Sounds yummy, we just bought some cabbage so I think we’ll make this sometime this week! Made this for dinner last night. Even my 80 year old mother enjoyed it, and she is finicky. This looks and sounds yummy. I’m wondering though about the gassiness that can come with eating cabbage. Has that been an issue for anyone with this recipe? Can someone recommend a kielbasa that doesn’t have corn syrup, dextrose, high fructose corn syrup, ad nauseum? The only brands found locally are the standard Eckrich, Hillshire Farms, Johnsonville, etc. They all have sugars and toxic waste. Is it best to go to a butcher? I’m at a loss here. Kielbasa is my favorite sausage but the flavor is not a good trade for the garbage that comes with it. I just bought a brand called Pederson’s Natural Farms. Only ingredients are pork, water, and seasonings! Better late than never–Boars Head kielbasa has no sugar and is readily available in Virginia..
Amanda, can you tell me where you bought the Boars Head? My Krogers doesn’t even have it. Thanks! We have been using Turkey Keilbasa and you honestly cannot taste the difference, but you save big time on the fat count! My husband who is picky when it comes to different stuff even loves it! 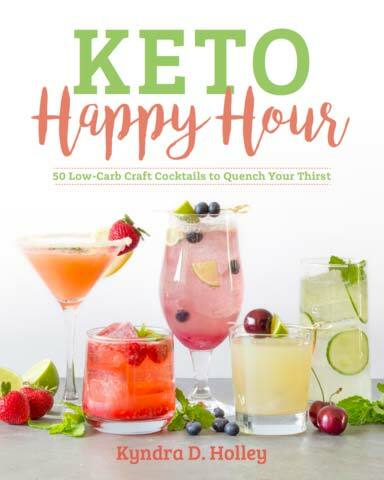 I thought keto/low carb is about not worrying about fat content? 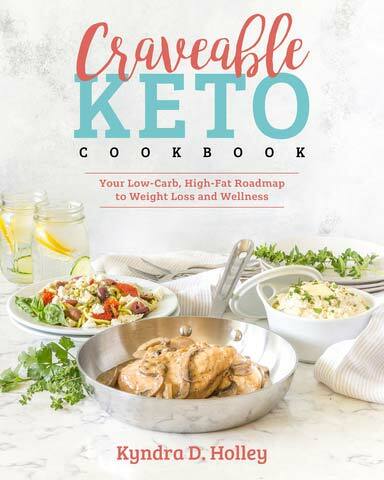 okay, all new to the keto way of eating – what is counted net carbs or total and sorry for being stupid…what’s the difference. Starting on Monday trying to make sure i start out right. So much to read and sooooo many different opinions on right and wrong. From all the calculators I came up with this. I want to lose weight (lost 70 lbs last year on 1200 calories a day). I didn’t totally derail, but lately can’t get enough carbs and I have gain back 10. Need to get off 40 more. Not looking for a miracle more of a natural way of eating in the long run. Any help would be appreciated. Can you tell me if this combo is a good starting point for weight loss. Question–I have leftover half a head of green cabbage and half a head of red cabbage–do you think I can use both green and red cabbages for this recipe, or should you just stick to green cabbage? I made this last night to the accolades of the entire family, including my 2 picky kids! The red wine vinegar smelled overpowering when adding it to the pan but once the veggies were sauteed into it, it was perfect! The flavors were great and the kielbasa added the necessary smokiness to the dish. Will definitely add this to my meal rotation. Made this with a couple of alterations & it turned out delicious! My husband & I are dieting, so rather than the 6 tbsp of butter, I used a bit of olive oil. I also used turkey kielbasa. I’ll be using this recipe again. Is there any other ingredients to subsitute the onions and garlic. Not a f a n of onions,and my mom is algeric to it. Throw in any low carb veggies you like. It’s an easy dish to play around with and make it to your own liking. I made this for dinner tonight, I did not have sausage so I used ham. My family enjoyed the dinner. So happy you enjoyed it!! Thank you so much for taking the time to come back and tell me. This was amazing. I used a local made kielbasa and about half the butter, didn’t need it after the meat and its grease. The red wine vinegar was unexpected but took it to the next level, the smell will burn your nose at first but mellows out and gives a tiny hint of tang. I ended up adding more onion and used smoked paprika. Amazing!! We just had this for dinner and it was delicious. It doesn’t require too many ingredients and it was easy for me to prepare, and I’m a novice cook. 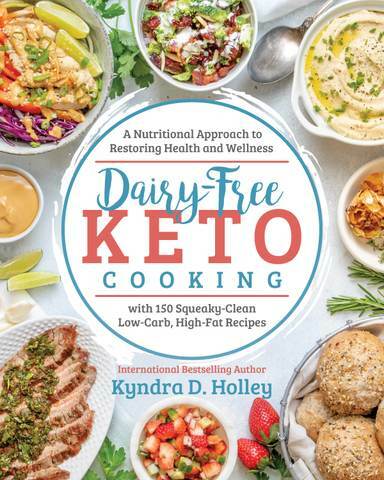 I am pre-diabetic and my doctor recommended low-carb and it’s been so great to find so many wonderful recipes. This will definitely be added to our weekly rotation. Instead of the butter I use homemade Chicken Broth. A cup or two and I let it steam the cabbage . Great recipe anyway. I use olive oil and turkey kielbasa to lower the calories. So good. I make it a couple times a month. Thank you so much! Made it exactly to the recipe. Was so delicious!! 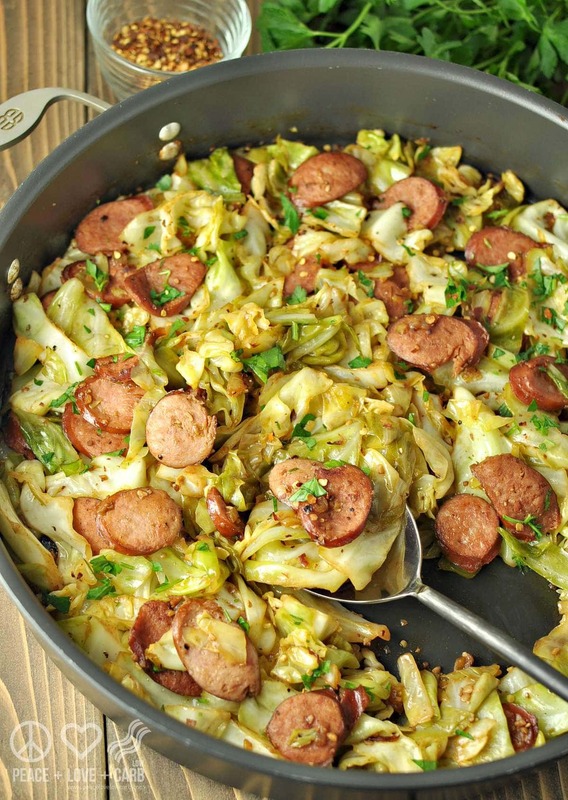 Two of my favorite things – kielbasa and cabbage. The red pepper flakes added just the right amount of heat. If you don’t mind the carbs add a side of mashed potatoes. OMG! So good. This dish is on my weekly rotation and oh my holy goodness is it fabulous!! Boyfriend and I crave it constantly, we add a little more vinegar cause we love it so much! Thank you for this simple, healthy meal! Made this tonight with mashed potatoes it was fabulous even the kids and my husband loved it and asked if we could have it again! So happy you enjoyed it!! Anything that is husband and kid approved is a WIN! 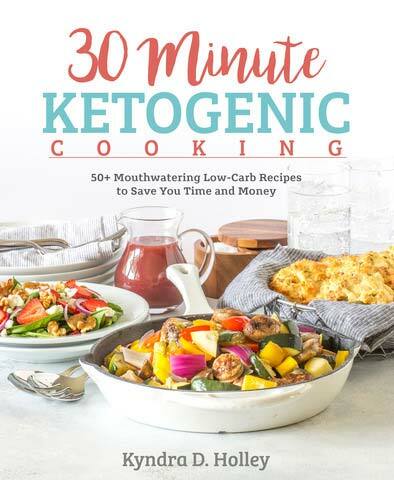 I need to get back on the LCHF bandwagon, but would like to try this. Other than possibly using half of the onion, what else could be done to lower the total carbs? I’m trying to stay at 20 carbs/day. The net carbs are low on this dish. 9.5. I just planned for this dish. It was so worth holding most of my carbs till dinner. The cabbage cooks down considerably. Thanks for sharing this wonderful easy recipe. I was wondering why not just use sauerkraut but I’d already bought the cabbage and I’m glad I did. Very different from sauerkraut! Reduced the butter some but glad I trusted the hot pepper. Bravo on the yummy recipe. Made this for New Year’s day–where I’m from, it’s cabbage for good luck on Jan 1st (southerners eat black-eyed peas). Gave some to my mother for good luck, and she loved it. I used andouille sausage, with the rest of the ingredients the same, and it was really good. So good, in fact, that I’m making it again, with kale instead of cabbage, and it’s only been five days ago that we last had it! Delicious! Each time I make it, a bigger head of cabbage is chosen so as to have more in the pan. For the salt & pepper, only 1/4 tsp was used, same amount for red pepper flakes added during cooking. Will try cooking it in the crockpot sometime just so that I may walk away while it is cooking. I like to be lazy and use bagged cole slaw mix for recipes like this! Any idea how many bags/oz I would need?! This is my favorite recipe that I have made from this website! So yummy! I made this tonight. Have been looking for alternative recipes. Getting bored with same old, same old. This was outstanding. Only problem was I reached into cupboard and only had white wine vinegar. Still worked out. (I am a recipe follower not a pioneer.) Thank you so much! My daughter and I started your program this week. We made this last night for dinner and OMG what an excellent tasty meal! My daughter is not fond of cabbage but absolutely loves this! Thank you so much for this website, your great recipes and inspiration! It’s all very much appreciated! Thank you! So simple, yet so good. I was quite surprised. This is delicious! My hussband even approved it!! I didn’t have wine vinegar but had balsalmic and it added a great flavor. I don’t go for the higher fat like some do, so, used half the butter and turkey sausage. Didn’t miss the fat a bit. This will be added to my “go to” recipe list. Thank you so much. Thank you for this recipe! It is now a go-to for my family. We have it at least once a week! Everyone loves it! We make this dish all the time. I use ground beef if we can’t find good sausage. I also add a little coconut milk if we have any leftover, which makes it little creamy. SO easy, SO good. Thanks for a great quick recipe! I make this a lot and exactly as written. It is a huge hit and when my son comes to visit I make it for them. They love it, in fact cooking it right now. My husband is diabetic and I am gluten free so an easy delicious meal. Before going super low carb tof control Type 2 diabetes, I would made this discussion in a hundred combinations but with potatoes! Much of the time I am at a loss for a substitute. As a child, cabbage was either boiled with corned beef or coleslaw. Needless to say, I developed an aversion to cooked cabbage. I am going to try this – over the years I have realized that lightly sautéed cabbage is yummy, while boiled beyond recognition is not. I have a substitute!! Thanks! Love your posts! I just made this dish and it is Delicious! I added veggies I had on hand to the cabbage. Will be making this and variations of it regularly! I’m eating this as we speak! Okay… this is my second helping actually. 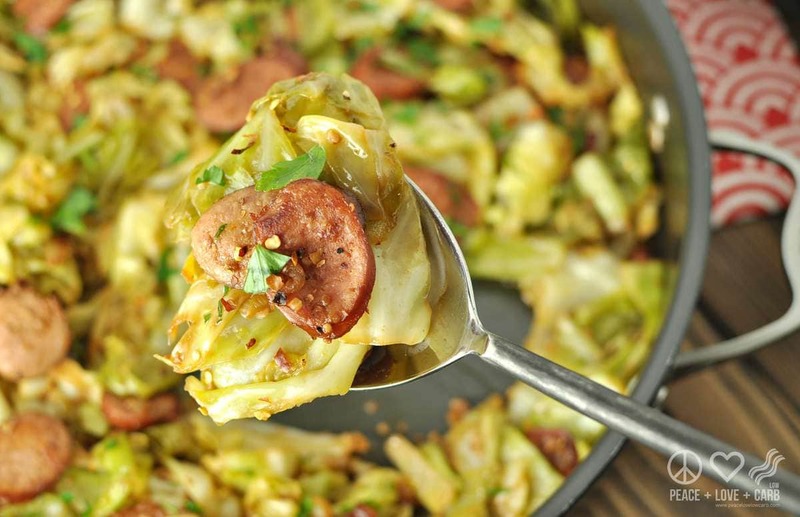 I love cabbage and sausage and this is very tasty!!! It was very good. I used Olive oil instead of butter and twice as much meat. I noticed that the kielbasa rendered a fair amount of fat into the pan. So, instead of using more butter, I just used the rendered fat and the existing butter. It worked out really well and still tasted great. Awesome recipe and super quick and easy to make. This is one of my husband’s favorite dishes that I make. It is now a go to at our house. I think for awhile it was on the menu every week. Thank you for sharing. I made this tonight, everyone loved it, even my picky eater daughter who’s 19, this was really easy,the hardest part was shredding all the cabbage. I used only half a head, it was enough. It looks like it was enough for 6 servings anyway, at 1 cup per serving.. I’ll be making this again and again! So glad everyone liked it! I seem to be doing something wrong, I am reading the carbs @ 29g and the fiber at 16.5g which doesn’t equal 7NC..
Here’s another one I make regularly! It is so simple to throw together for a simple lunch with loads of flavor!! Thanks! This is one of my favorite recipes! I like it with sauerkraut but my kids prefer cabbage. If you want to spice it up more, add a little cayenne, which is also an anti-inflammatory. I make a version of this. Use any sausage you like. Italian hot. Italian mild. Country etc. The sausage arfs most of the spices. A super easy low carb delicious meal! Excellent dish! Just the right flavor and spice! Quick,easy and delicious in 6 servings. Cook once, eat twice! That’s what I’m talking about! This was delicious and so easy to make! Thank you for sharing!! This was bomb.com. Followed your recipe to a T, even the optional choices. This was my first meal after deciding to eat Paleo, and this recipe made me feel so ecstatic with my decision. Thank you soooo much! Made this with venison sausage. So good. How much is a serving and can you clarify how many net carbs per serving? Counting carbs and on Atkins so need to stay below 20 net carbs per day. Ty!